Before and 3 months after Lip Enhancement with fat. Lip enhancement is a very common and highly popular procedure which can be carried out as a cosmedical treatment with temporary results or surgically with permanent results. The newest injectable fillers which are approved and reliable are non-permanent injectibles and are designed with a viscosity especially for use in the lips. 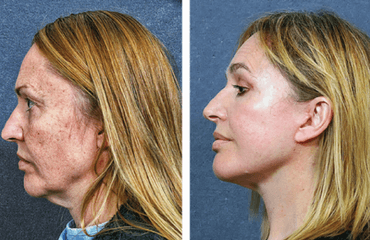 These fillers are hypoallergenic and very stable and results can last anywhere from 6-12 months depending upon how much the patient animates and their own absorption rate. It is possible to “top up” a result to maintain an even appearance at all times. We try to avoid permanent fillers as a small percentage of patients develop a reaction which is called a granuloma and this lumpiness is very difficult to treat. 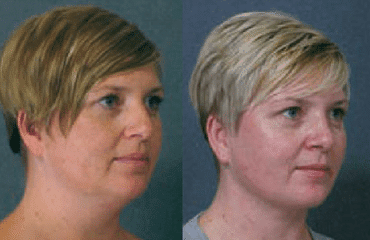 Another reason permanent fillers are not advised is because as the face ages, the filler will remain static and not be in harmony with the ageing face. 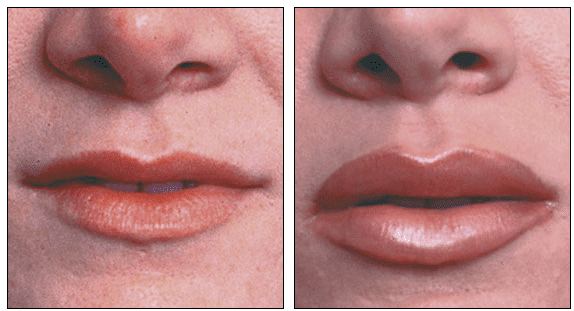 For permanent enhancement of the lips, Dr. Hodgkinson employs either a dermal graft or a patient's own fat. How Can I Make My Thin Lips Bigger? We have a number of excellent ways of plumping out your lips. Even if your lips are not necessarily thin we can enhance the way they look either temporarily or permanently and with the trend towards cosmetic dentistry, enhancing the lips can make the smile even more attractive. There is a range of injectable fillers available for a temporary result. The newest one normally lasts longer than collagen, which has been used for more than 20 years. For more permanent enhancement, I use either a dermal fat graft or the patient’s own fat (usually drawn from the abdomen or inner thigh).